The movement toward inclusive play environments is gaining momentum, and it's an exciting development in modern playground design. Last month I attended the Play for All! seminar in Denver where I met Dawn Oates. Dawn is the mother of Harper Oates, a mobility impaired five-year old. Harper’s parents are championing a barrier-free existence for their daughter, and with their help Harper seems to be doing everything a five-year old would want. Dawn and Harper Oates exploring together. When Harper’s parents realized their local playground was not designed in a way that would allow Harper to play alongside her siblings, they began to form a vision. They imagined a world for all individuals where there were no barriers to sports, play, and recreation, and where inclusion was the cornerstone of community. From that vision, The Play Brigade was born. The Play Brigade provides inclusive sports and recreation equipment to communities and organizations; educates about the importance of the need and right to belong and participate in play, regardless of age or ability; and provides programming that brings people of differing abilities together. The Play Brigade's Facebook page is an excellent resource when designing outdoor play areas that accommodate people of all ages and abilities. 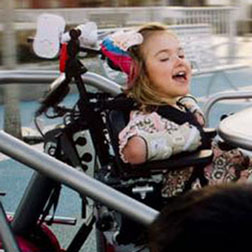 The site shows the types of facilities and play equipment available for the disabled. It highlights the various challenges people face and shows possibilities of what can be incorporated into playground design. The site has also numerous photos, links to videos and events, and posts by site visitors. Dawn told a wonderful story at the Play for All! conference. Harper and her classmates participated in a race at her school. Harper was in her motorized chair and the others were on foot. The starter’s gun went off and Harper revved her chair and the other kids all began to run. When Harper edged out the other racers, the gym roared with cheers for her. I was reminded of Harper’s exciting victory recently when I came across a race track which was incorporated into the Play For All Park in Round Rock, Texas. It is exciting to work on these kinds of projects at Design Concepts, where we are privileged to design inclusive play areas such as Inspiration Playground in Bellevue, Washington. This blog is part of a three-part series by Design Concepts on inclusive play environments. See Inclusive Play Design with Occupational + Physical Therapists by Carol Henry. Inclusive Play in Colorado: Where Can It Happen by Lisa Langer will be posted soon. Newer PostInclusive Play in Colorado: Where Does it Happen?